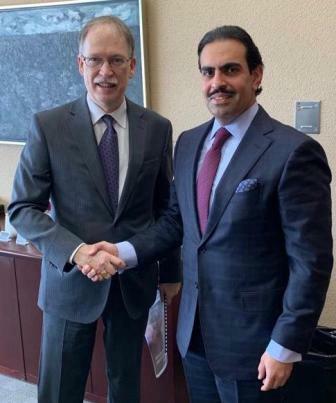 The Non-Resident Ambassador of the Kingdom of Bahrain to Canada, Shaikh Abdullah bin Rashid Al Khalifa, met with the Clerk of the Privy Council and Secretary to the Cabinet of Canada, Ian Shugart, in Ottawa. Ambassador Shaikh Abdullah discussed ways of strengthening cooperation between the Kingdom of Bahrain and Canada in various fields, including political, military and economic. He congratulated Mr. Shugart on his recent appointment as the Clerk of the Privy Council, after having served as the Minister of Defense since 2016. He affirmed the Kingdom of Bahrain’s keenness to further develop bilateral relations, particularly in the field of trade exchange and combatting terrorism, highlighting the Canadian distinguished practices in the fields of education and health. He also noted the role of Canada in maintaining security and stability in the region through its participation in the Combined Task Force 150 (CTF 150) since 2004. For his part, the Clerk of the Privy Council expressed thanks to the government of the Kingdom of Bahrain for hosting the Canadian forces, affirming the keenness of the government of Canada to further strengthen cooperation with the Kingdom of Bahrain in all areas.